Email seems to get a bad rap. Countless new communications apps pridefully boast of themselves as being “email killers,” people complain about their overcrowded inbox, and spam might narrowly beat out pop-ups as the most annoying part of the web. Yet, email has been shown time and again to be an incredibly effective method of communicating with an audience. Nearly 97% of companies surveyed use email marketing of some form and in another study roughly 44% of said that email directly led to a conversion. 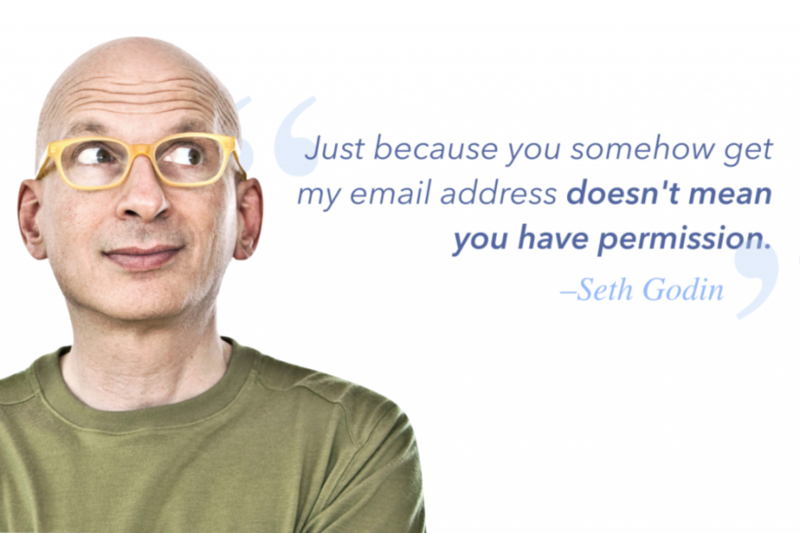 Email is certainly effective, but only if you do it right. Violate certain expectations and things might not go as well. Annoy your customers over email and you could end up on your customers bad side and headed straight for their “spam” folder. This article will show you how to create a sustainable, and consistently engaging email newsletter that drives results and engages your subscribers on a regular basis. In Seth Godin’s remarkably prescient 2000 book Permission Marketing he talks about the end of consumer’s tolerance for being interrupted. While this may have been a revelation 15 years ago, by today this should hopefully be gospel for online marketers. With that being said only send emails to those who have given you explicit permission to do so, there’s no faster way to be forever labeled “spam” than to send unsolicited email. 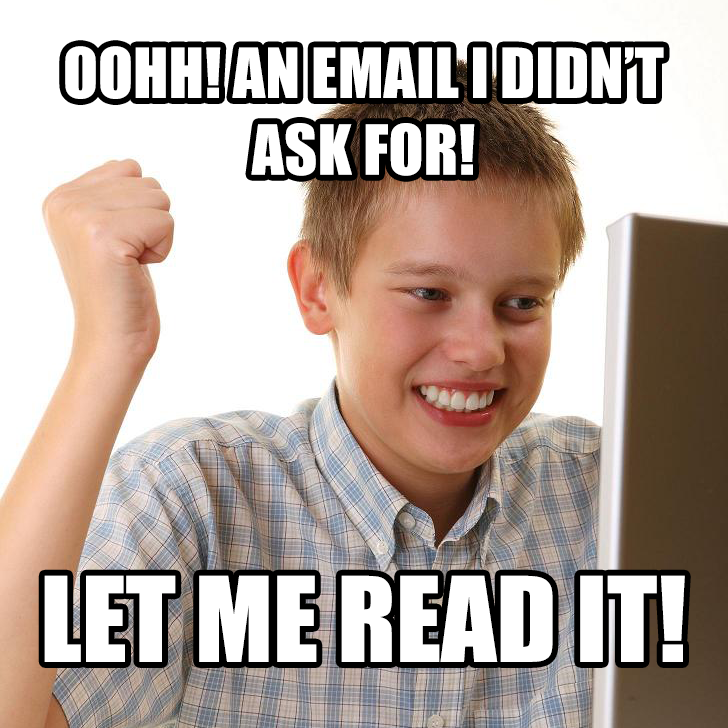 NEVER buy an email list! Number of opens is a vanity metric and you will spoil your brands reputation if you send unsolicited mail. An even bigger risk you run from sending your emails to a purchased list is having too high of an unsubscribe rate. This might cause your IP address to get flagged and your newsletter to get automatically labeled as spam even for the email addresses you acquire organically. Beyond giving your brand a bad name and possibly hampering your ability to effectively deliver emails, buying an email list just doesn’t make sense. I mean, what’s the best case scenario? Someone who has never heard of you before sees this random email in their inbox, opens it, and instead of being annoyed they fall in love with you/your product/your brand? If anything, email signifies the highest degree of permission you can get. This is one of the few online activities that remains relatively private for most. Far from sending emails to those who have given you no permission, emails should only be sent to those who have given you multiple levels of permission. Make your email the final stage of engagement with your audience. Think of it as your inner circle. Viewing your email newsletter in this light should make it so that you don’t care so much about the quantity of subscribers as you do about the quality. You certainly need permission to send emails if you want them to be effective, but that doesn’t mean you should be shy about asking for that permission. Every time someone interacts with your brand or consumes a piece of your content, they are in essence giving you a tiny bit of permission to keep their attention. Each interesting insight or useful post is priming someone to inch closer toward entering your inner circle. Any instance where someone might be suddenly inspired to grant you permission to send your message to their inbox should give them an easy, unobtrusive way to do so. If your call to action for email sign-ups is only in one place then you probably are not being aggressive enough. Each of your pieces of content should include at least some form of CTA. This definitely doesn’t mean an email sign-up light-box covering up every page (that should happen, at most, once – the very first time someone visits your site), but it means at least one light CTA on every page. 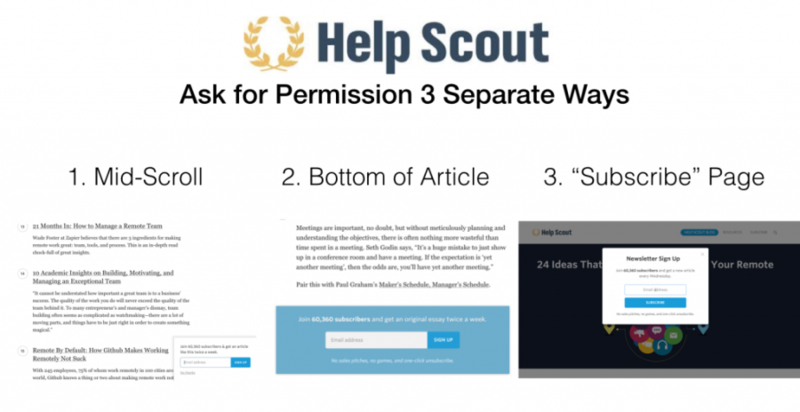 For a great example of how to get in front of your audience in a subtle, unobtrusive yet effective manner look no further than the content marketing geniuses at Help Scout. 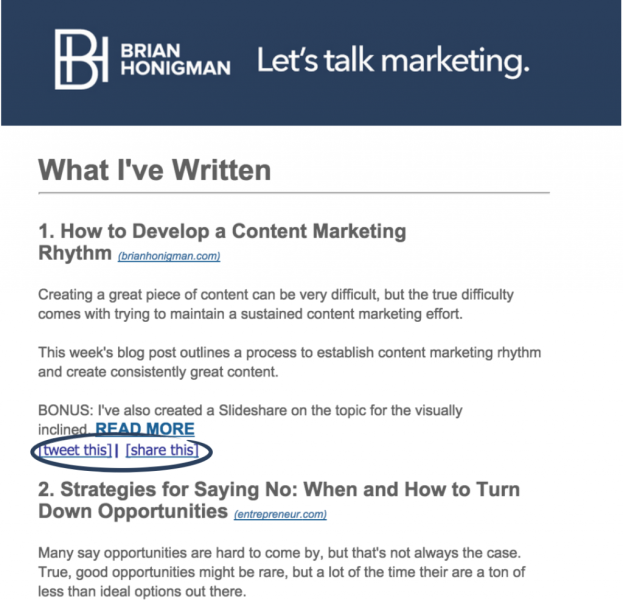 On every single one of their pieces of content there are three ways to sign up for their email list, yet none of them really ever get in the way of enjoying the content itself (which, after all, is what will inspire someone to sign up in the first place). Help Scout has a small sign-up box appear after you scrolled down (i.e. engaged with their content), another sign-up field at the bottom of each article and also has a subscribe link at the top of the page that instantly gives you a sign-up light box. While using a direct sign-up form as a CTA works for Help Scout, it is not your only option. Especially if you feel that people might be new to your brand, then a dedicated page explaining what to expect from your newsletter is perhaps a better alternative. Convince and Convert does this particularly well. Not only do they have a page explaining their email newsletter, they even include an option to see a preview of a sample newsletter to give you a strong sense of what to expect. Providing your audience various ways to learn about your offerings will increase the likelihood that you catch them when they are willing to sign up and will help expand your network organically. You might think that the best email newsletters with access to the most resources might be flashy and full of striking imagery. Truth is though, outside of the fashion industry, the top email newsletters are shockingly simple. 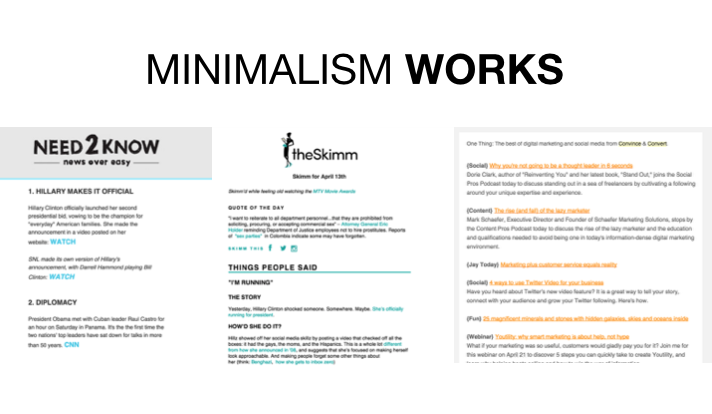 Publications like TheSkimm and Need 2 Know that are entirely reliant on email use 90% undecorated text. In fact, this no-nonsense approach achieves fantastic results. TheSkimm’s open rate is reported to be an astonishing 45% on average, going up to as high as 80% some days. Don’t let the lack of panache fool you though, the simplicity of these newsletters only works because it highlights the quality of content they bring to the table. While you shouldn’t expect to deliver a newsletter every day, you should use your email newsletter to consistently connect your audience to the best content. This content doesn’t even necessarily need to be your own. There is certainly room for curation as well, so long as you deliver great content in an easily digestible way. 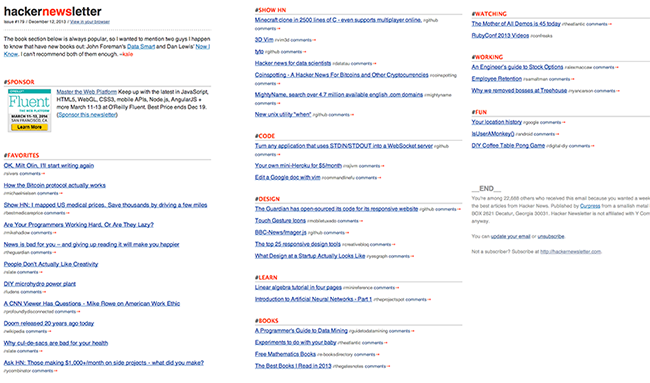 Y Combinator’s Hacker Newsletter doesn’t offer any original content, but does curation particularly well. This combination of simplicity and curation alongside original content will not only provide value, but (perhaps more importantly), it will allow you to maintain consistency and a sustainable content rhythm. In fact, the hallmark of an engaging and sustainable email newsletter is that it will allow you to spend most of your time working on the content/curation itself and will not get in the way of that valuable information when it arrives in your audience’s inbox. While consistency is key, don’t just send out an email without having anything to say. This is just squandering the permission that you worked so hard to get. First and foremost, the job of the email newsletter is to reward your subscribers for taking an active interest in you by giving them more value than they could get from you on any other platform. One small, yet instructive example of this (there are many, many ways to provide value and a lot will depend on your customer and industry) is to have your email serve as a vehicle for discovering and sharing great content easily. The Skimm (and my newsletter too!) provides built in sharing buttons so that if you see an article that you like, you can share it easily and instantly. Not only does this provide benefit to the audience, but you receive a mention out of the deal as well. Constructing such win-win situations, and systematically building them into your emails will let you accrue benefits quickly and build a positive feedback cycle with your audience. The necessary precursor to succeeding with email newsletters is to consistently deliver value, but this is only the beginning. What separates the good from the great is going above and beyond for your subscribers. I’ve already mentioned that email should constitute the closest possible audience connection, which requires your business to focus on going the extra mile for your biggest fans. Whether it’s something as simple as a shoutout, or access to exclusive content, any acknowledgement of your subscribers is bound to go a long way. I wrote an article for Jumplead where I went over 8 ways to reward and delight your email subscribers. 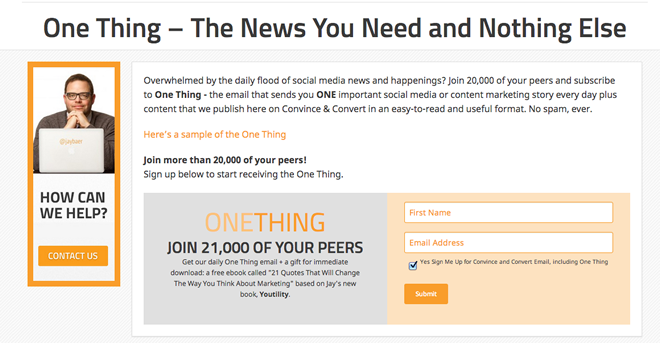 If you are serious about creating the best possible email newsletter, this might be a valuable thing to read next. If you take nothing else away from this article, I hope I have at least one point. Email is far from dead. Email newsletters might seem old-fashioned, but the reason they’ve endured so long is simple. It’s because they work. 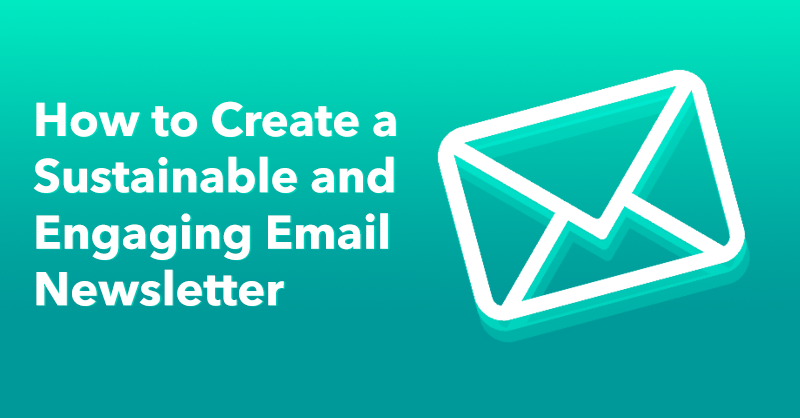 Using this post as a guide, you should have no trouble creating a sustainable framework for a consistent and engaging email newsletter.